← Share Your Experiences of Radical Self-Care! 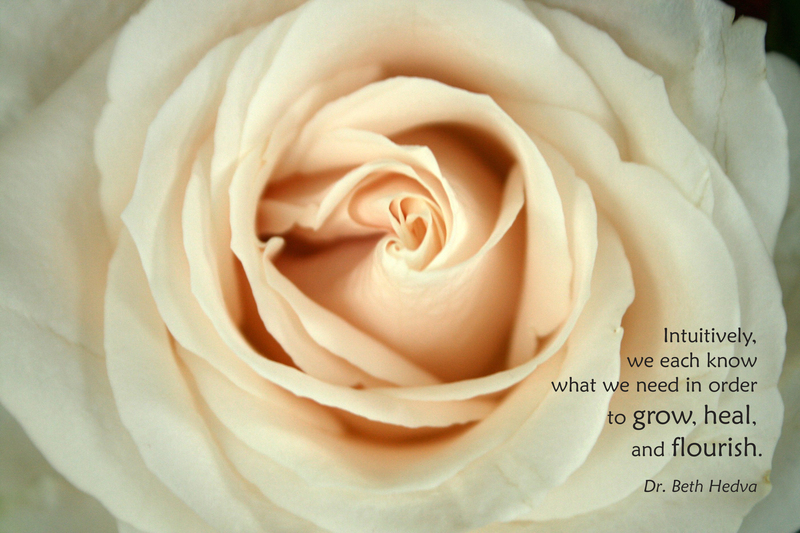 I would like to comment on the quote above, “Intuitively, we each know what we need in order to grow, heal, and flourish” to perhaps get a dialogue going about how others view intuition. My thought process does not see intuition as a part of me, but rather a part of a greater, higher power separate from me. The statement above appears to speak of intuition as a part of the person and perhaps suggests that we can retrieve, at will, information intuitively at any time. Although I might agree with the quote above after talking it through with the author, I would first have to translate each of our meanings on what Intuition means, as I have my own interpretation and meaning, which I’d like to attempt to explain here. Intuition is a separate voice from my own. It is not part of my awareness, in that I do not create the message, consciously or unconsciously. In short, I have come to view intuition as the voice of God. I see any direction given to me as the will of God, for me to follow. Although naturally psychic, I have made it a conscious practice not to be ‘on’ psychically for many years, choosing only to be very mindful of what psychic impressions I’m getting and also to be responsible with them.—I digress, but my point is I clearly have a distinct understanding, of what intuition is and what being psychic is, as it relates being in my own skin. I have chosen to live by faith and by God’s will for me. I rely on guidance and trust it will be there in the moment, as the moment unfolds. Therefore, Intuition is a message, a direction, or knowledge, given to me. Something I did not learn or had acquired before within me, such as a memory. It is comes from a place not of this superficial world. Psychic impressions are all part of this superficial world (Superficial= something we can feel, or see—something that resides HERE) including any ‘levels’ of this world. The difference in the messages of intuition and psychic are that intuition is separate from me and this world. Whereas, psychic is a sense and I can choose to use it, or turn it off, or ignore it. Psychic is also coated with me, my weather, and my flavor. Everything I receive will be received or perceived through my worldly, superficial experience. Whereas, intuition I do not control, nor is it tailored in any way to what my experience is in this existence. In fact, it is so off my regular thought process I am sometimes taken aback at how contrary it is to my normal patterns of thinking.